Cathy Behrens has a message for her fellow seniors: It’s time to get off the bench and get in the game. 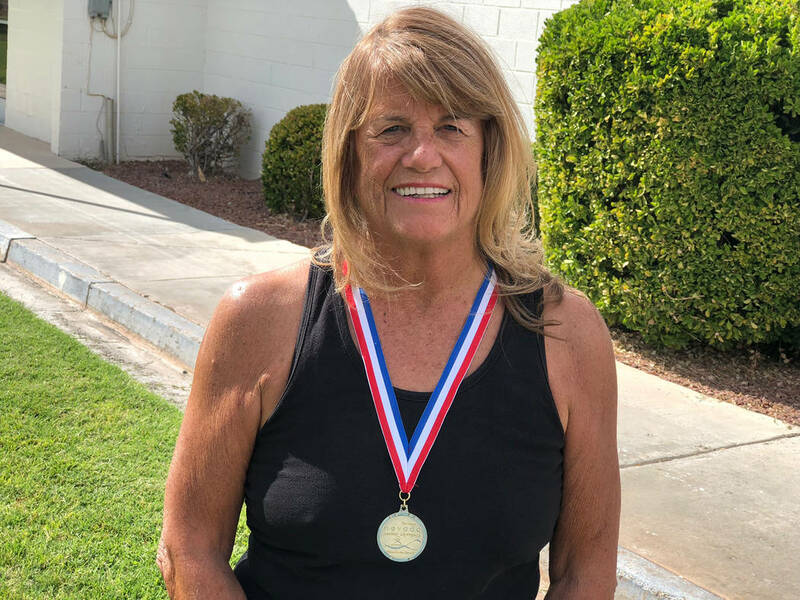 Tom Rysinski/Pahrump Valley Times Cathy Behrens won a gold medal last year, her first competing in the Nevada Senior Games, and will compete in two events this year. Tom Rysinski/Pahrump Valley Times Pahrump resident Cathy Behrens displays the gold medal she won last year in the 75-to-79 division of the 50-meter freestyle in the Nevada Senior Games. Behrens is one of several Pahrump residents who have participated in the Nevada Senior Games, an event that includes events from archery to weightlifting each year. The Senior Games was not Behrens’ first competition. The Euclid, Ohio native took part in a Corporate Challenge 12 years ago, when she was working as an esthetician on the Las Vegas Strip. She entered a couple of other competitive events, including winning a swimming competition and finishing second in a dance contest; she puts the blame for not winning on a wardrobe malfunction with her strapless dress. Behrens, who remembers coming to Las Vegas with “no job, no furniture and a little bit of money” before “tripping and falling into a good job,” had purchased property in Pahrump by that time. “I bought the property as an investment and a place to go to be quiet,” she recalled. “I worked on the Strip, and I worked with a lot of people. I wanted a place to be quiet. It took me six months to find my property, and I love my property. I never thought I’d live on it. Behrens, 76, has lived in Pahrump for the past three years. She said she learned about the Nevada Senior Games from the internet, not assuming success. “I went in there and didn’t know anything and didn’t know what to expect,” she said. If anything, she was a bit intimidated by some of the competition. But, after 1 minute, 3.69 seconds in the pool, she had a gold medal in the 75-to-79-year-old division of the 50-meter freestyle. So naturally that Behrens has expanded her activity. The swimming competition will take place Oct. 6-7 at Pavilion Center Pool in Las Vegas. 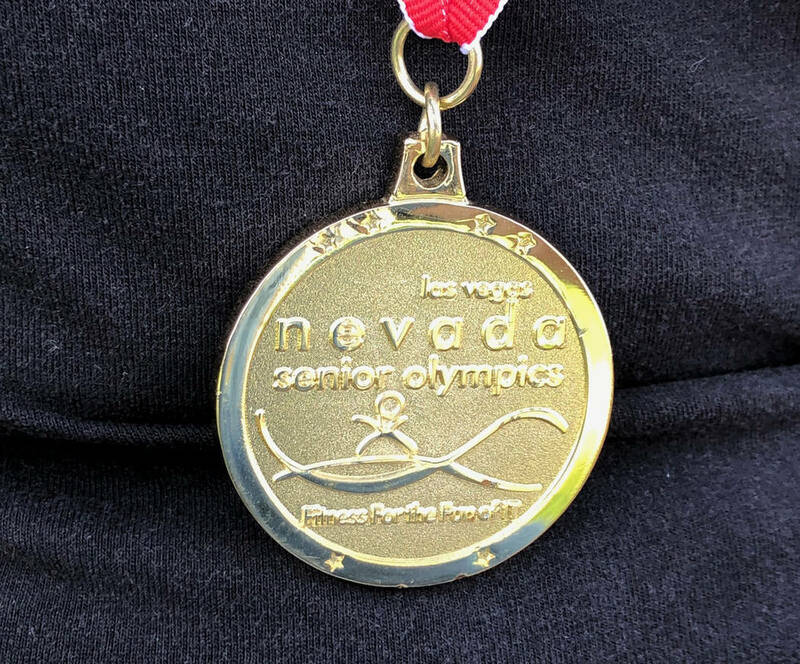 Pahrump was well-represented in last year’s games: In addition to Behrens’ gold, Susan Zink brought back three silvers and a bronze in the 65-to-69 swimming division, and Debra Moore won two golds in backstroke in what was her debut in the competition. Out of the pool, Marvin Caperton added to his hefty haul of hardware with golds in the 50 and 100 meters in the 60-to-64 division in track. But Behrens wants more seniors out there competing. Even though Behrens loves to compete and loves to win, just being there is a victory of sorts for her. Registration deadlines for events in the Nevada Senior Games. Sept. 1: Golf, pistol shooting, tennis, triathlon. Sept. 15: Bocce ball, rock climbing, walk-a-thon, weightlifting/fitness. Sept. 20: Dance, pickleball, racquetball, shuffleboard, table tennis, women’s basketball. Oct. 1: Badminton, bowling, cycling, swimming, track and field.